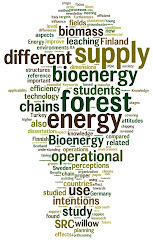 Bioenergy Corridor: Public perception on forestry and policy makers: divergence? Public perception on forestry and policy makers: divergence? FABRA-CRESPO M, MOLA-YUDEGO B, GRITTEN D, ROJAS-BRIALES E. 2011. Public perception on forestry issues in the Region of Valencia (Eastern Spain): diverging from policy makers? Forest systems. 21(1):99-110. Are the policies designed by decision-makers differing from society's wishes and preferences? The present paper analyzes the divergences between forest policy and public opinion in the Region of Valencia (Comunidad Valenciana) in Eastern Spain. The data is based on an extensive telephone survey of the general public on their perception of forestry issues. The issues studied include attitudes regarding forest fires, silvicultural treatments, the externalities produced by forest owners, and the state forest service's role related to these issues. In total, the answers of 823 respondents were analyzed using classification trees. The results of the analysis showed a large divergence between the desires, preferences and priorities of society, on the one hand, and the policies implemented by the regional government, on the other. The study concludes that communication strategies concerning sustainable forest management need to be further developed by the responsible authorities, with the input of the research community.